The area was likely inhabited in prehistoric times, but it is first mentioned in the Homer’s Odyssey as the place where King Menelaos stopped during his return from Troy to bury his helmsman, Phrontes Onetorides. The archaeological area has the fortress which includes the Sanctuary of Poseidon, the Temple of Poseidon & the village. The sanctuary of Poseidon occupies the southeastern edge of the fortress. 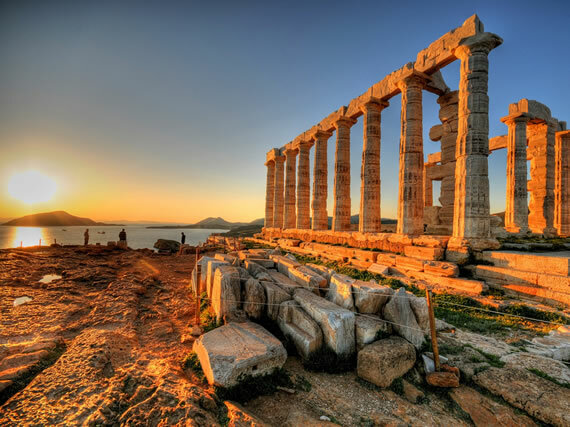 The Temple of Poseidon is located in the southern & highest point of the cape. It was built in the mid 5th century B.C. It’s a Doric temple & it had 6 columns on the short sides & 13 columns on the long & dimensions 31,12m x 13,47 m. For its construction were used marbles from "Argileza". Today there are only 11 columns left (in one of them Lord Byron has carved his name). At a lower hill, 500 m. northeast from the Temple of Poseidon, the ruins of the temple of Athena located near an irregular circular enclosure, which is the oldest mosque male deity known as "Frodo’s’ memorial". The visitor sees the foundations of two temples, the small Doric temple built at 6th century B.C., which was destroyed by the Persians & the largest Ionic temple built at 5th century B.C. 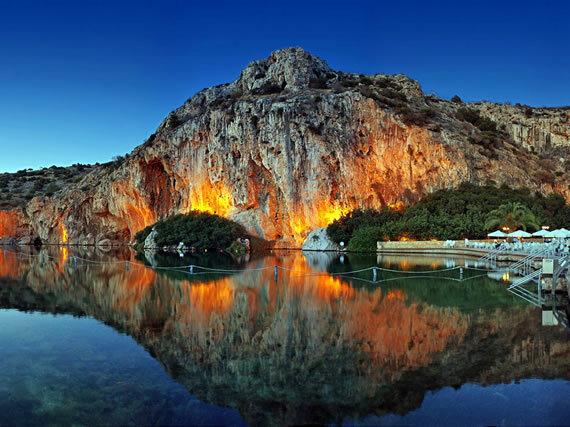 Due to its outstanding surroundings & its natural location the Lake of Vouliagmeni is an important Natural Monument. In accordance to scientific research the Lake was formed by geological changes millions of years ago. A huge underground cave exists which has not been fully explored yet. The main characteristic of the Lake is that the temperature of the water remains stable between 21o & 27o C. This happens because the water gushes from its water springs located 100 m. underground. The level of the Lake’s water is about half a meter above the level of the sea, therefore its water is constantly renewed. Due to water’s composition (Potassium, Lithium, Calcium, Ammonium,e.t.c.) & the fact that it is slightly radioactive, it has therapeutic properties (arthritis, backaches,….). Swimming is allowed all times of year.